NDS launched a mobile app called Stormwater Drainage Tools. The new app can calculate stormwater runoff and determine requirements for implementing a variety of drainage solutions. 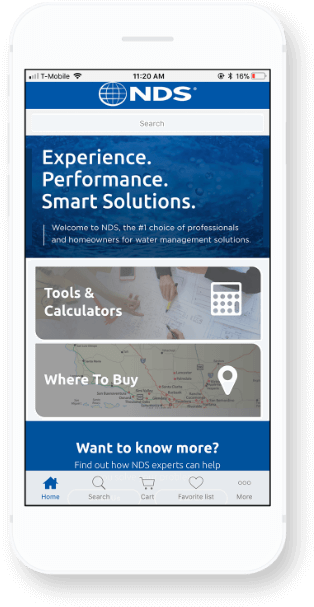 The app includes NDS’ complete product catalogs for drainage, stormwater management, irrigation and flow management. It features a calculator to determine runoff in gallons per minute and cubic feet of water per second, as well as required pipe diameter for any given drainage need. A separate calculator is included for determining the number of dry wells needed for detaining collected stormwater and the type and size of drainage pipe needed based on area size and surface type, the depth and thickness of gravel backfill and the slope of drainage pipe. The NDS mobile app is available for free download at Apple’s App Store and Google Play.